Hello there, my name is Socks! My name may not be original, but I sure am! 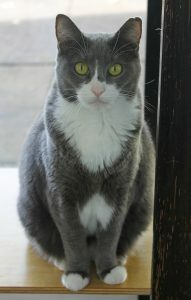 I’m a beautiful and sweet blue and white tuxedo girl with silky soft fur and a lovey-dovey purrsonality. I’ve lived with other kitties before, but am also okay as a one-and-only kitty. 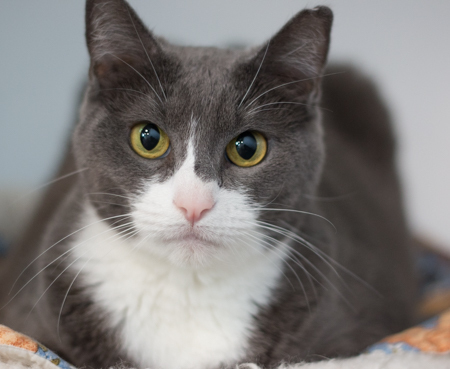 I’m pretty easy going and am most interested in getting love and lap time! I’ve lived inside my whole life and don’t really have any interest in going out. Besides, it’s cold outside! Are you looking for soft, warm Socks to keep you toasty this winter? Come by Pixie and let’s get acquainted! I come to you fixed, vaccinated, and micro-chipped for an adoption fee of $100.